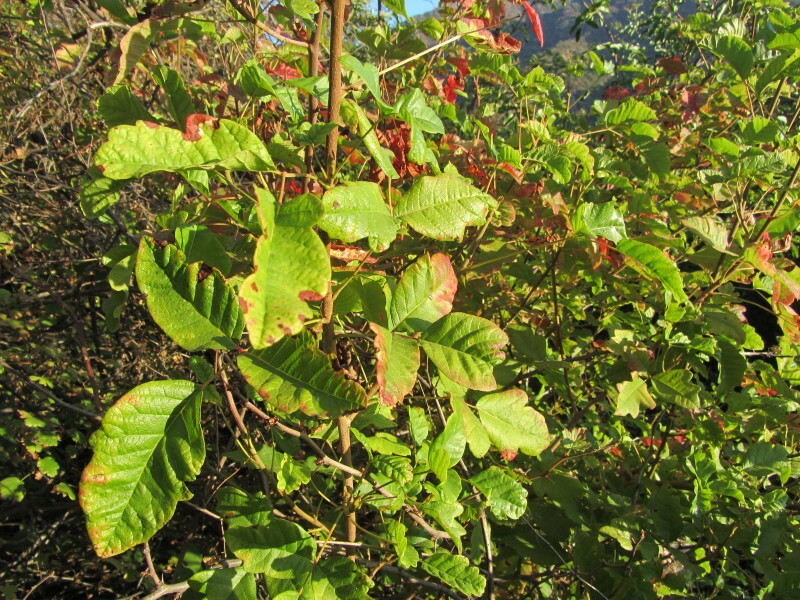 Poison oak occurs in mixed evergreen forests, woodlands, chaparral, coastal sage scrub, and riparian zones, usually below 5,000 feet. 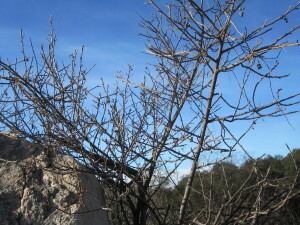 It is the most widespread shrub in California. 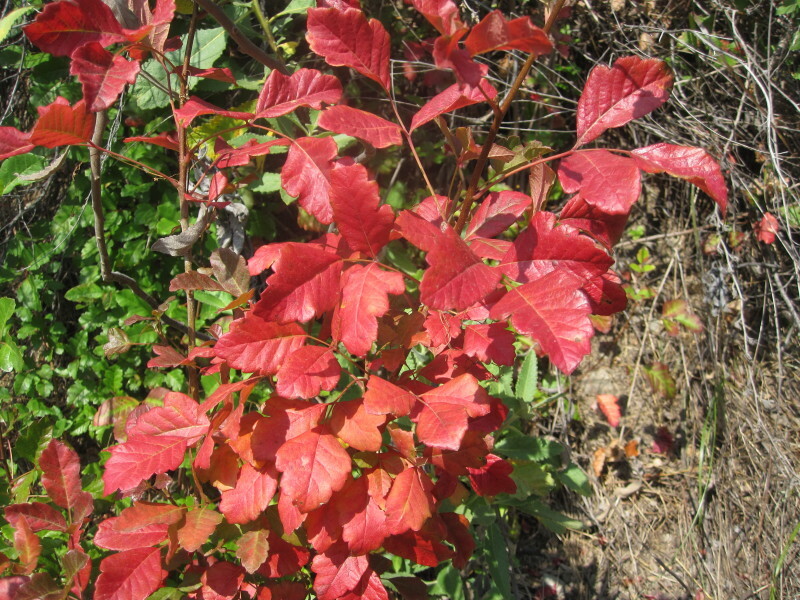 Poison oak is a many-stemmed, deciduous, native perennial shrub or woody vine. 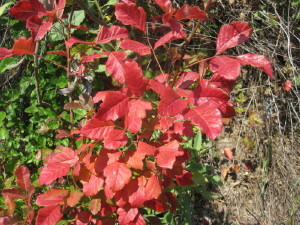 Shrubs are erect with stems from 2 to 6 feet tall. 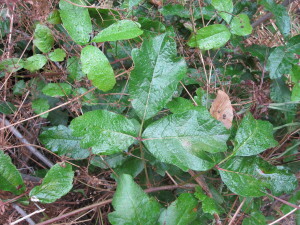 Vine stems commonly reach 10 to 30 feet, but may be as long as 100 feet. 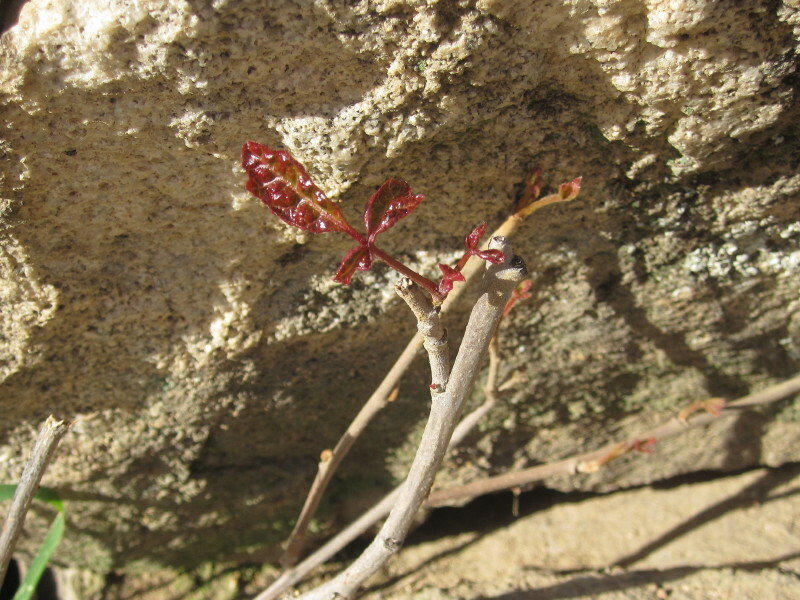 As a vine, poison oak climbs trees or other support by adventitious roots and/or wedging stems within grooves or crevices of the support. The bright green leaves have three (sometimes five) round to ovate, diversely lobed or toothed leaflets that usually resemble oak leaves. Small greenish-white flowers occur in leaf axils, with male and female flowers on separate plants. Blooms February to May. 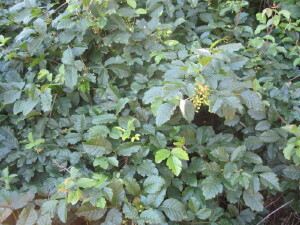 During summer and fall, female plants produce small clusters of ivory-white fruits (drupes, small berries) . 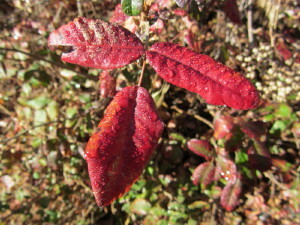 During the summer and fall the leaves turn bright red, yellow, and orange, and then the plant drops its leaves during the winter months. Rhizomes are at or just below the soil surface, and are extensive. 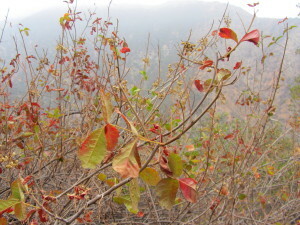 It regenerates readily after disturbances such as fire and the clearing of land. Poison oak contains oily sap called urushiol (u·ru·shi·ol, pronounced oo-ROO-shee-awl), which triggers an allergic reaction when it comes into contact with skin, a form of allergic contact dermatitis. An itchy rash can appear within hours of exposure, but for most people, the rash does not appear for two or three days. A person can be exposed to urushiol directly from the poison oak, or by touching contaminated items, such as clothing, trekking polls, camping equipment, gardening tools, and even a pet's fur. 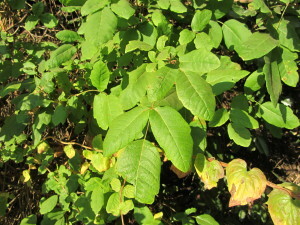 Urushiol is found in all parts of the plant, including the leaves, stems, roots, and fruit, and is even present after the plant has died. Urushiol is absorbed quickly into the skin and can also be inhaled if the poison plants are burned, causing a very serious allergic reaction. Skin is not automatically sensitive to urushiol. Sensitivity builds up after the skin is exposed to the substance. 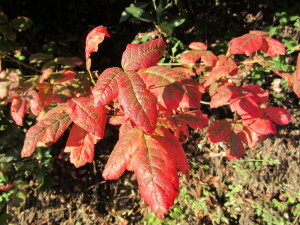 - Redness and itching of the skin. - A rash erupts on the skin, often in a pattern of streaks or patches from where the plant has come into contact with the skin. - The rash develops into red bumps, called papules, or large, oozing blisters. An allergic reaction to poison oak cannot be cured, but the symptoms can be treated to help relieve the itch. Most rashes caused by poison oak are mild and last from five to 12 days. In severe cases, the rash can last for 30 days or longer. The rash cannot be spread from one part of the body to another or from person to person and Scratching or touching the rash and fluid from blisters will not cause the rash to spread because urushiol is not present in the blister fluid. Armstrong, W.P. 2011. "Poison Oak: More Than Just Scratching The Surface." 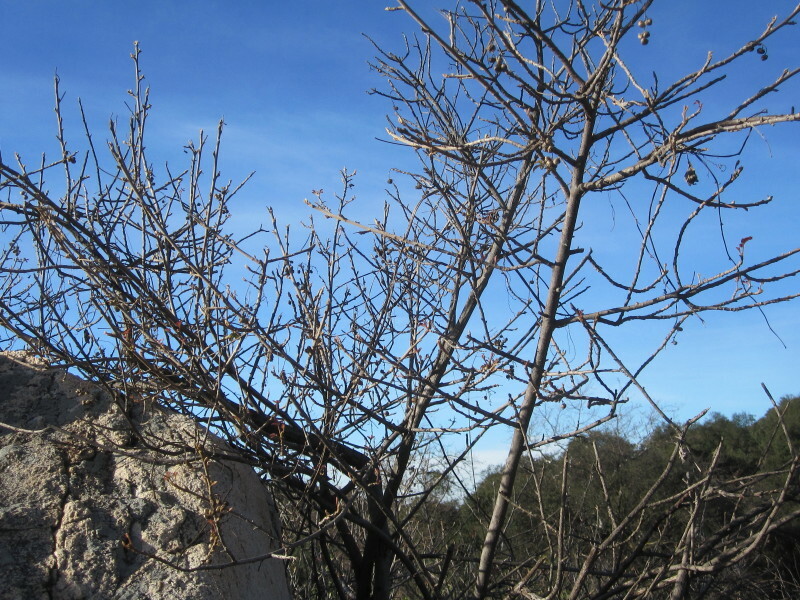 Wayne's Word: 16 January 2011. http://waynesword.palomar.edu/ww0802.htm (July 25, 2014). 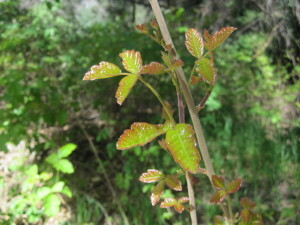 For many years of hiking, I never got poison oak. I’ve been around it a lot on the trail, but I’ve always managed to escape its nasty effects. I didn’t know if I was just really good at avoiding it, or if perhaps I was one of the small percentage of the population who is immune to it. Some years back I was talking with a naturalist and I said I was considering rubbing some poison oak leaves on a portion of my arm to see what happens. He said, NO! He admonished me not to introduce it into my system since each exposure creates greater sensitivity to it. 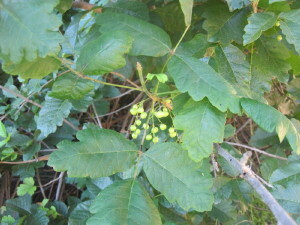 So I continued my diligence to avoid poison oak. 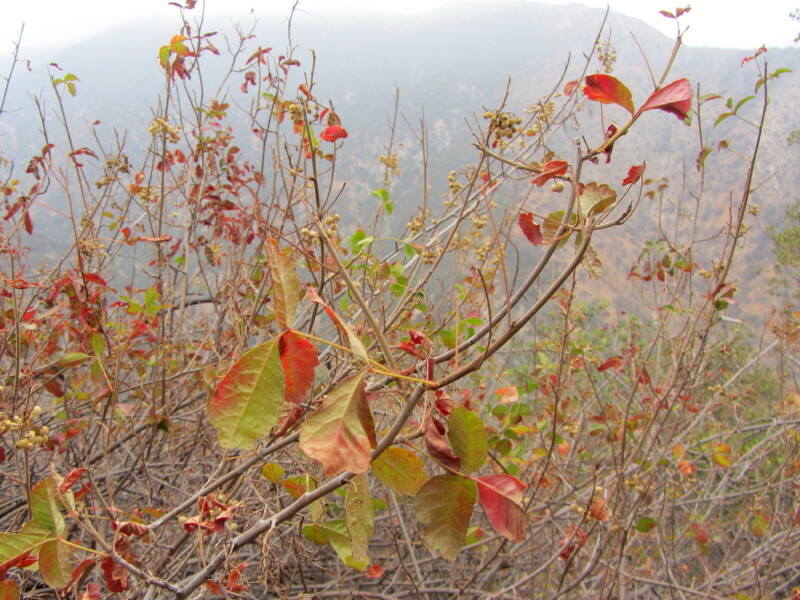 Then finally in 2012 while after trimming poison oak on Fish Canyon Trail, it got me. A couple days after my outing, the rash began to appear on my wrists. I suspect it got through the opening between my leather gloves and long sleeves. 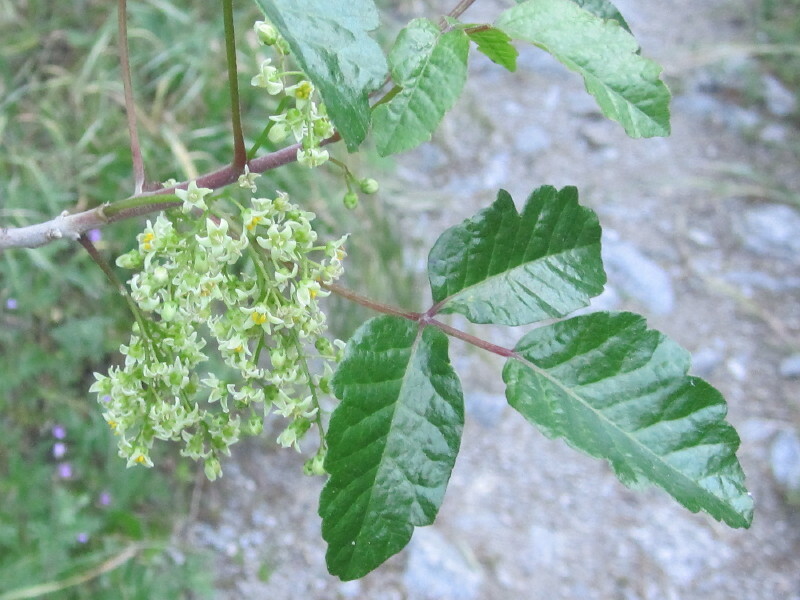 Since then I’ve got poison oak on two other occasions, both times on Fish Canyon Trail while doing trail work. The most recent time was in July 2014, and I have no idea how it got it since I had only sniped three or four poison oak branches and never had any contact with it. So I don’t know what happened, but I’m not pleased with my new-found sensitivity to the toxic plant. Learn to recognize it and avoid it. 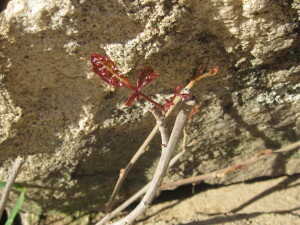 “Leaves of three, let it be.” Also watch overhead as it may be growing in among the leaves of real oak trees. Wear long pants and long sleeves. 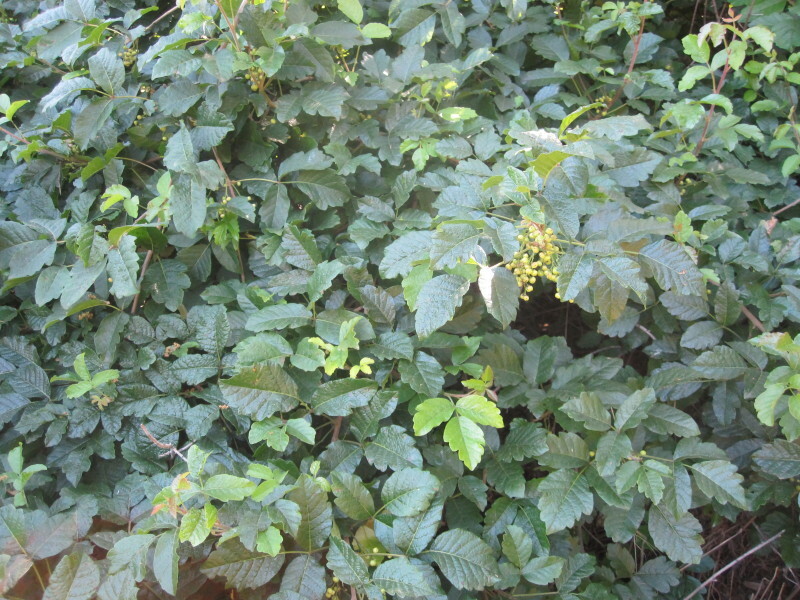 Consider using a product such as Ivy Block®, which helps protect skin. 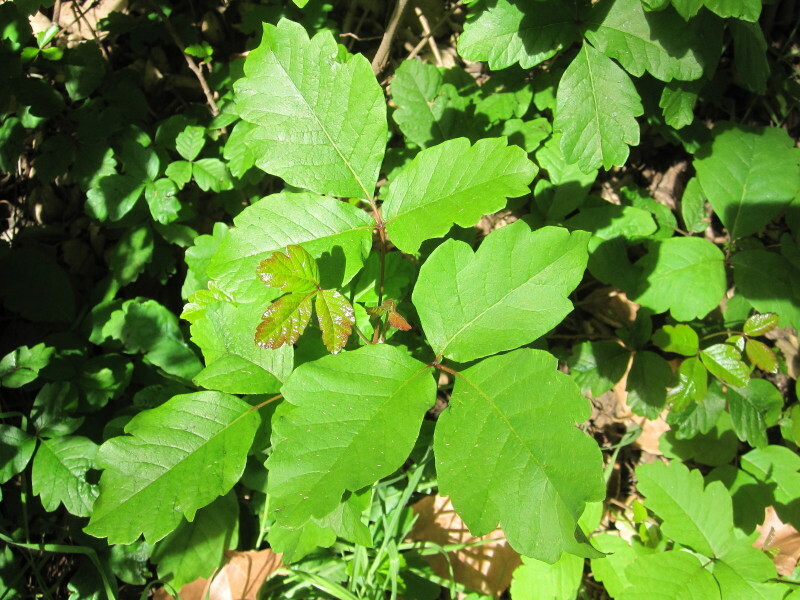 Take care in handling clothing or items that may have come in contact with poison oak. Be especially careful with your pet to avoid urushiol from being transferred from its fur to you. 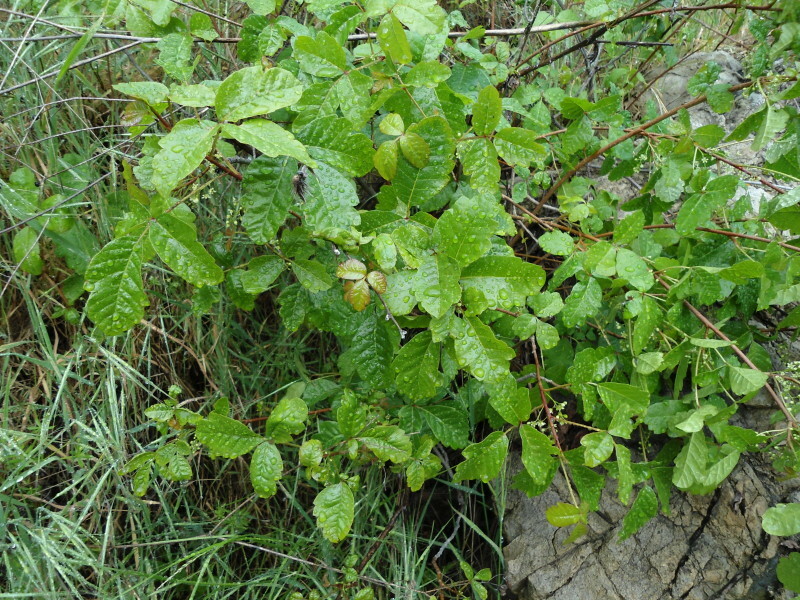 If you think poison oak has contacted your skin, wash immediately. 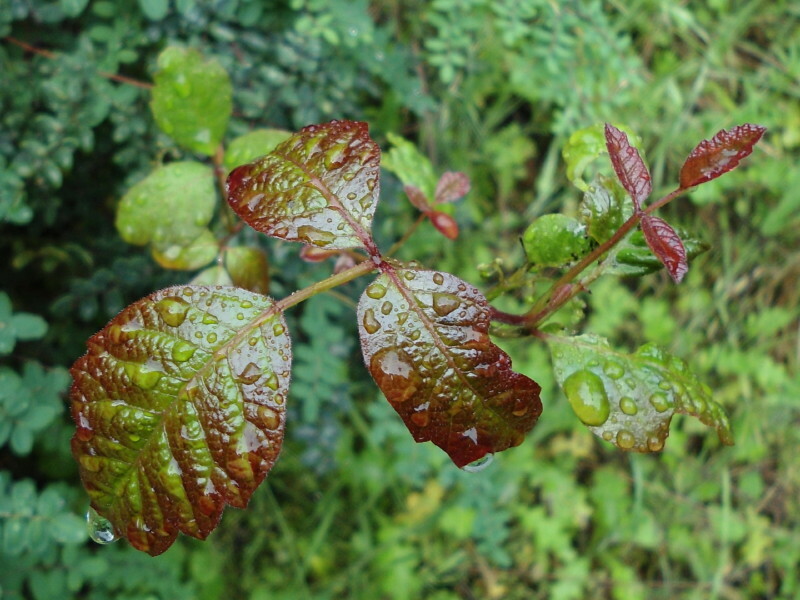 As an oil, urushiol is difficult to remove, so wash well with soap and water, or rubbing alcohol, or a product such as Tecnu Oak-n-Ivy® Cleanser. You have about 10 minutes to wash the oil off your skin before it penetrates the epidermal layer. This page was last updated August 12, 2014.